There’s nothing like giving your deck a good clean to start off the new summer season for when people are going to come over and with the right tools and equipment, it’s not such a bad job to do. Firstly you may want to sweep away any leaves and dirt that may have built up over the past few days from the weather, if this is done regularly you could prevent any serious damage done to your deck over time. Once you have done this take verything off your veranda that could be damaged by water and get a hose pipe or a high pressure cleaner and give it a spray, the high pressure cleaner will do the job on it own. If you are using jus a hose pipe you might have to speend some time on your hands and knees scrubbing away stubborn dirt. Next, Grab the bucket and mix some detergent in their with warm water, spread this all over the deck and then get a brush and sweep the detergent and water off while brushing try get off any dirt or marks that have been harder then the rest. 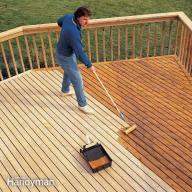 After you have done this give the deck another wash and let it dry over the day, this should leave your deck in the cleanest possible shape.